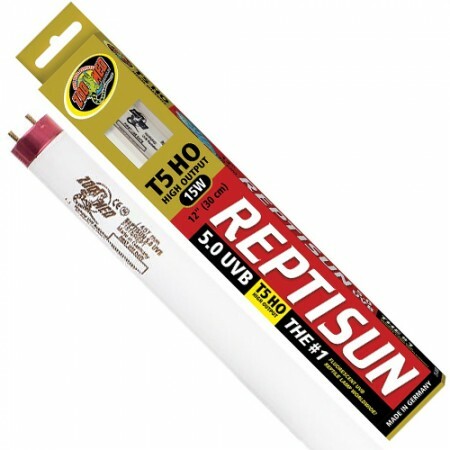 Zoo Med Reptisun T5 HO 5.0 UVB High Output Bulb offers an increased UVB and brighter light output that's perfect for larger reptile habitats. Measuring just 5/8" in diameter, this lamp doesn't take up valuable space, but is still twice as strong as standard 5.0 UVB bulbs. Tropical Lizards (Green Iguanas, Day Geckos, Anoles, Water Dragons). Aquatic Turtles, Box Turtles and Tortoises. Old World Chameleons (Panther Chameleons, Veiled Chameleons, Jackson's Chameleon, etc). 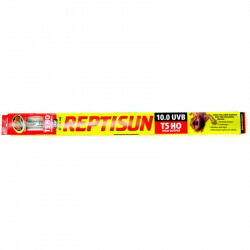 UVB: Reptiles need UVB for vitamin D prodction and calcium metabolism. Without UVB, reptiles can develop Metabolic Bone Disease in 6 months or less. This lamp, along with proper temperatures, will enable your reptiles to make vitamin D and process calcium from their diet. UVA: Reptiles and amphibians can see things that humans can't. UVA is part of the rainbow of colors that reptiles can see. UVA helps to increase activity levels, appetite, and reproductive behaviors. Without UVA, they are color blind! Lamp Fixture: For use in fixtures rated for T5 HO (high Output) lamps. 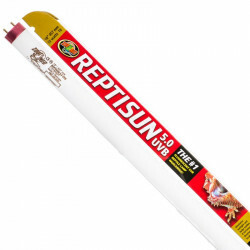 For best results, use Zoo Med's ReptiSun T5 HO Terrarium Hood. Lamp Distance: Refer to the back of your lamp's box for optimal UVB emit distance (15W - up to 18"). Glass and plastic filter out UVB; there should be no glass or plastic between tha lamp and your reptile. Fine mesh blocks up to 50% of light and UVB. This should be taken into consideration when determining lamp distance. 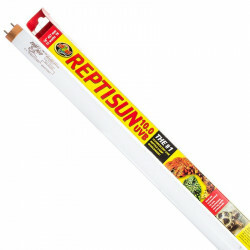 The T5 ReptiSun HO is designed for most reptiles housed in terrariums that are 12" to 18" tall. Always have lamp at least 6" away from your animal. The optimal distance from T5 HO lamps to the animal is 12-24", depending on the lamp. When To Replace Your Lamp: This lamp will provide your animals with beneficial UVB for a period of 12 months when used 10 to 12 hours per day. Record date of first use of lamp and replace after 12 months. I purchased the 54W 46inch T5 HO bulb after having purchased the hood AND bulb from Pet Mountain a few months ago. I am extremely pleased with the superior service, packing, and prices on Pet Mountain products. Unlike some similar bulbs purchased from another mega-online vendor last year that miraculously came through shoddy packing, BOTH TIMES I have purchased the Reptisun bulbs from Pet Mountain, they have been so carefully protected during shipping. These products were for a large tank housing a near-adult bearded dragon. The bulb lit right up when replaced (the other one broke), and beardie's life was once more made better during these shorter, cold winter days. This bulb, IF I could even find the proper size locally (couldn't) would be far more pricey than that offered by Pet Mountain. So pleased, yes! Best price for this bulb I have found! The tortoise loves sunning under it.